Users of TubePress Pro have no doubt recently received the following email from YouTube warning about an impending update to the YouTube API Terms of Service and other legal agreements. Nearly all tech companies periodically update such agreements with their users. And while some updates are more ominous than others, the “February 10th, 2017” update from YouTube is largely benign and will have a very small impact on TubePress users. The good news is that the changes do not apply retroactively, which means that any existing copies of TubePress are not suddenly in violation. 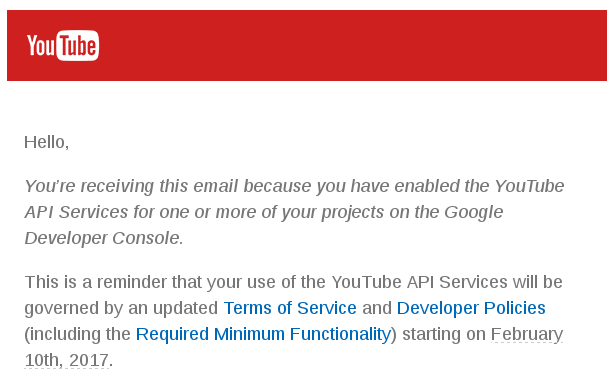 This does, however, mean that any future versions of TubePress will need to meet YouTube’s new requirements in order to stay within compliance. Below we’ve summarized what to expect in future versions of TubePress. As you can see, most of the changes are very minor and are geared towards protecting user privacy. Display a link to YouTube’s Terms of Service in TubePress and update the TubePress Terms and Conditions as per section III.A.1 of the new Developer Policies. Prevent TubePress from storing any YouTube API data for longer than 30 days as per section E.4.d of the new Developer Policies. In TubePress galleries where YouTube videos are mixed with Vimeo and/or Dailymotion videos, provide proper attribution to indicate which videos are from YouTube as per section F.2.a of the new Developer Policies. Prevent the YouTube embedded video player from displaying at a size smaller than 200 pixels by 200 pixels as per the new Required Minimum Functionality. Change the behavior of autoplay (i.e. start playing a video as soon as the page loads) to be compliant with the new Required Minimum Functionality. Prevent YouTube thumbnails from displaying at any size less than 120 pixels wide by 70 pixels tall, as per the new Required Minimum Functionality. In summary, these changes will not affect the majority of TubePress users. We will ensure that future versions of TubePress (including our major update currently under development) are compliant with the terms set forth by YouTube, so there’s no action needed on your part at this time. Thanks for using TubePress, and please don’t hesitate to contact us if you have any questions!